In 1850, Captain John Edwardes, of Sealyham, Haverfordwest, Wales, set out to establish the breed which we know today as the Sealyham Terrier. Captain Edwardes was intent on creating a new breed which was small, robust, dead-game and not only intelligent but also of pleasing appearance. Though the combination of breeds that produced the Sealyham has always been kept secret, it is generally thought that its ancestors were the Pembroke Welsh Corgi and the Dandie Dinmont Terrier. 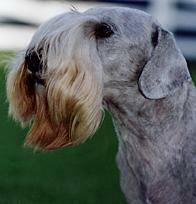 The Sealyham Terrier can live up to 15 years. Those fortunate people who have had a good Sealyham Terrier seldom want one of another breed in its place. A good Sealyham is meant to be good in character, health and looks. They are individuals and completely satisfying as companions in and out of doors. They make very good guards. They become devoted to their family of owners, they never forget a friend or a foe. They are most affectionate and return the love they get fully and joyfully. 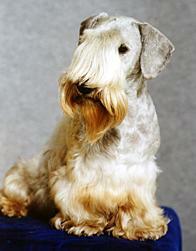 As a puppy, the Sealyham Terrier can be taught to live with cats, other dogs, and birds. His boisterous nature, particularly with older pets, can be annoying but once he settles into a family, peace returns! No family should take on the Sealyham Terrier unless they are prepared to look after it properly and particularly looking to the coat care. Being white, this double coat needs regular combing with a strong wire comb to get right down to the job of keeping the coat free of matting. This little dog does not suffer with any major health problems.